Accessible from any device in the form of a web application B2B Online portal is easy to use. Base your search on more than 50 parameters, including tax ID and address. Just enter your access data and engage in a detailed and efficient search of competitors and potential clients. Check financial reports of your selected subjects for the last five years, track companies and divide them into groups for easy viewing. Search includes the detailed overview of all related parties, newly established companies, and companies of all sizes. List and compare multiple companies. See how your company stands next to the competition. We collect our data from public databases. Our goal is to enable companies and individuals to easily search for information that can help them make better business decisions, improve daily operations, increase sales, and also reduce risk through a selection of solvent clients and partners. Whether you're dealing with finance, sales, marketing, or accounting, it's up to you to choose which companies or entrepreneurs you want to check. Then, see whether you are interested in financial statements, balance sheet, profit and loss account or any other parameters. By using only a few characters easily locate director, the owner or the company itself. Advanced search allows the possibility of crossing criteria leading to the desired companies that fulfil all wanted demands. The status of the company indicates whether it is active, deleted from the register or an entity in bankruptcy or liquidation. Select as many as 21 status fields. Know where the company is established based on its geographical location. 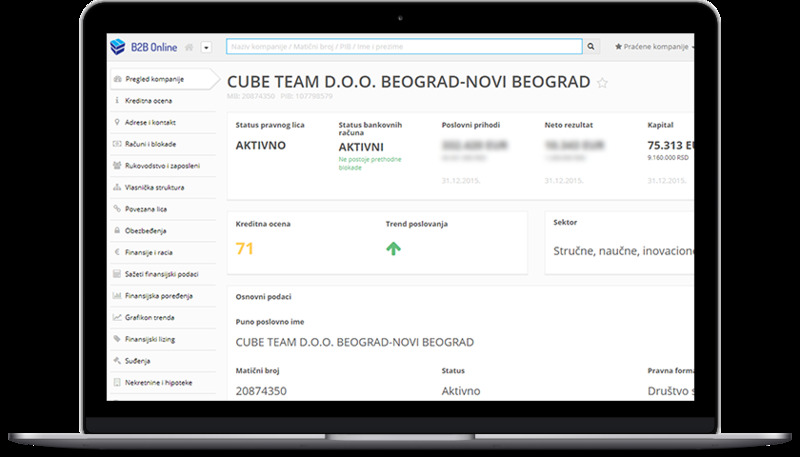 Search for business at the city or municipality level. The legal form indicates whether it is a limited liability company, an entrepreneur, public company or an open joint stock company. The number of available legal status search queries is 36. Establishment date is search criteria allowing you to choose time span (example 2016-2017) and see all the established companies within the date range. This means that you can choose companies that are established at any time, on a particular day, but to also keep track of those that are just opened. Account status tells you whether the company account is active, blocked, and whether there are previous blockages. It is also possible to have an insight into how long an account was blocked, but also to search based on the exact time during blockades. The registered activity gives an insight into the core business for which a certain legal entity is registered, or talks about what a company’s dealings. B2B Online can be integrated into your company's ERP or CRM system through the API service. This way, the download of data is automated, and the possibility of error is minimized. Our consultants are at your disposal to find the best solution for your business. Contact us to make your business even more efficient and secure.